How much do you know about microdermabrasion? Do you know that it is one of the most gentle, fast and non-invasive anti-aging treatments available? Microdermabrasion is more than a facial but not as harsh as a chemical peel. It is a facial treatment designed to remove dead skin cells and essentially “resurface” your complexion to reveal a healthier and more youthful appearance. 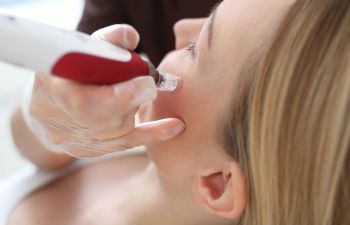 First developed in 1985, microdermabrasion involves a mechanical wand-like device that exfoliates the stratum corneum (outermost layer) of dead skin cells using tiny crystals. The skin interprets this as a minor injury, so it triggers your system to produce new healthier skin cells. The microdermabrasion device includes a compressor and simultaneous vacuum feature that is gently swept across the face in a circular motion. The entire procedure can be performed within half an hour or less, but multiple treatments are sometimes needed to achieve ideal results. As far as results, you can claim a softer, smoother and more even complexion with this simple microdermabrasion procedure. The best microdermabrasion results are seen in people in the early stages of aging, between 35 and 50. Keep in mind that microdermabrasion can temporarily remove moisture from your skin so be prepared to hydrate your skin with a rich moisturizer afterwards. In addition, you will want to stay out of the sun after a microdermabrasion, as those new skin cells will be extra sensitive to sunlight. Lastly, if you have skin conditions such as rosacea, eczema, dermatitis, active sunburn, herpes, lupus, open sores, psoriasis, fragile capillaries or widespread acne, microdermabrasion may not be recommended. Ready to book your microdermabrasion with some of Atlanta’s top dermatologists and estheticians? Contact Olansky Dermatology Associates.